Protesters took to the streets Thursday night, on the eve of President-elect Donald Trump’s inauguration, to rally near locations of several inaugural balls and events, WUSA9 reports. According to the news station, protesters in Washington, D.C., clogged up F Street Northwest near 14th Street outside the National Press Club, where an event dubbed the “DeploraBall” was being held, with many prominent members of the “alt-right” in attendance. Demonstrators from the group Refuse Fascism accused D.C. police officers of deploying pepper spray as they protested. 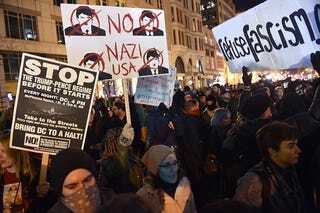 The news station reports that protesters allegedly threw bottles at people as they left the DeploraBall, and police came out, in full riot gear, with the pepper spray. On Pennsylvania Avenue and 14th Street, protesters apparently burned a “Make America Great Again” hat.